(TORONTO – March 31, 2014) Discover the original: The luxury crossover that stands alone as a stunning combination of SUV versatility and luxury sedan-based comfort and refinement. The Lexus RX 350 luxury crossover and RX 450h hybrid luxury crossover provide thoughtful, luxurious accommodation for five and superior driving capabilities on and off the road. For 2015, Lexus refreshes the built-in-Canada luxury crossover with the new RX 350 SPORTDESIGN and RX 450h SPORTDESIGN. 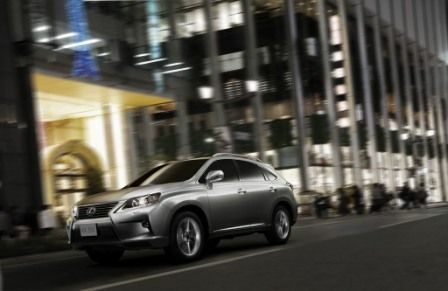 The 2015 Lexus RX series is offered in three models: The RX 350 SPORTDESIGN, the RX 350 F SPORT, and the RX 450h SPORTDESIGN. This model is offered with several enhancements for 2015, including: perforated leather seat surfaces; heated and ventilated front seats; a driver’s seat memory system; a power moon roof; new 19” aluminum alloy wheels; power-retractable folding and heated exterior mirrors with integrated signal lamps and puddle lamps; HID headlamps and the auto-leveling headlamp system; LED fog lamps and daytime running lights; a fresh front bumper design; silver painted roof rails; and more. The RX 350 SPORTDESIGN is powered by a 3.5L V6 aluminum block engine generating up to 270 horsepower and 248 lb-ft of torque. A six-speed automatic super ECT transmission with sequential shift mode and overdrive delivers responsive shifts, confident acceleration and impressive fuel efficiency at 11.7 L per 100 KM city/highway combined. Front and rear suspensions are enhanced with stabilizer bars, and the RX 350 SPORTDESIGN can tow up to 1,587 KG (3,500 lbs). Other standard features on the RX 350 SPORTDESIGN include: a 12-speaker Lexus Display Audio System with USB input, auto sound levelizer, Bluetooth connectivity, integrated XM Satellite Radio, steering wheel-mounted audio controls, and more; Dual-zone automatic climate control; Front door handles with touch sensor lock/unlock function; The Lexus Smart Key system with push button start; Power rear door with jam protection; Power windows with auto up/down function on all windows and rear privacy glass; Power adjustable driver and front passenger seats; a 40/20/40 split second-row seat with recline and slide, plus remote release in cargo area; Organic LED multi-information display with Lexus customizable features, ECO indicator and other driver-focused instrumentation; Leather-wrapped steering wheel and shift knob; 12v accessory power outlets and retained accessory power; Integrated garage door opener; Real wood interior trim; a roof-mounted spoiler; and more. Safety is always standard on a Lexus, and every 2015 RX 350 features Vehicle Stability Control, Traction Control, Antilock Braking System with Electronic Brake Force Distribution and Brake Assist, 10 airbags, a back-up camera, fast-acting LED brake lamps, an onboard first aid kit, an anti-theft system, and more. The RX 350 SPORTDESIGN may be enhanced with two available options packages. The Touring Package adds: A heated wood and leather-wrapped steering wheel; in-dash DVD player; Blind Spot Monitor; Intuitive Parking Assist; Voice-Activated hard-disc navigation system with the Lexus Remote Touch haptic controller; a wood and leather-wrapped shift knob, and electrochromic rear view mirror. The Technology Package builds on the Touring Package with: the Lexus Vehicle Dynamics Integrated Management system; a 15-speaker Mark Levinson Surround Sound Audio system with 7.1-channel speaker architecture; Premium leather seat surfaces; a 120v/400w power outlet; Heads-up Display system; unique woodgrain trim; front illuminated doorsill trim; and more. This model delivers F SPORT performance with an eight-speed transmission enhanced with paddle shifters, as well as front and rear suspensions enhanced with lateral dampers. This model is then designed around unique F SPORT styling – from F SPORT leather seats, unique 19” F SPORT aluminum wheels; and F SPORT badging. Driver enhancements include Intuitive Parking Assist, Heads-up Display, the Blind Spot Monitoring System; and more. The RX 350 F SPORT features a 15-speaker Mark Levinson Surround Sound Audio system, and a generous complement of luxury and convenience features as standard, including: Dual-zone automatic climate control; Front door handles with touch sensor lock/unlock function; The Lexus Smart Key system with push button start; Power rear door with jam protection; Power windows with auto up/down function on all windows and rear privacy glass; Power adjustable driver and front passenger seats; a 40/20/40 split second-row seat with recline and slide plus remote release in cargo area; Organic LED multi-information display with Lexus customizable features, ECO indicator and other driver-focused instrumentation; Leather-wrapped steering wheel and shift knob; 12v accessory power outlets and retained accessory power; Integrated garage door opener; Real wood interior trim; a roof-mounted spoiler; and more. This hybrid luxury crossover is offered with several enhancements for 2015, including: revised front bumper and grille; and new 19” aluminum alloy wheels. The 2015 RX 450h SPORTDESIGN features perforated leather seat surfaces; heated and ventilated front seats; a driver’s seat memory system; a power moon roof; new HID headlamps and the auto-leveling headlamp system; LED daytime running lights; silver painted roof rails; and more. The RX 450h SPORTDESIGN is powered by a Lexus Hybrid Drive built around a 3.5L V6 Atkinson cycle aluminum block engine, a high-torque electric motor/generator, continuously variable transmission with sequential shift mode, high capacity storage battery and sophisticated power management system to deliver 295 Net System horsepower, multiple drive modes including ECO, EV and SNOW mode, and fuel efficiency on par with a mid-size sedan at just 8.2 L per 100 KM city/highway combined. Front and rear suspensions are enhanced with stabilizer bars while the hybrid drivetrain is enhanced with Vehicle Dynamics Integrated Management. The RX 450h SPORTDESIGN can tow up to 1,587 KG (3,500 lbs). Other standard features on the RX 450h SPORTDESIGN include: a 12-speaker Lexus Premium Audio System with USB input, auto sound levelizer, Bluetooth connectivity, integrated XM Satellite Radio, steering wheel-mounted audio controls, and more; Dual-zone automatic climate control; Front door handles with touch sensor lock/unlock function; The Lexus Smart Key system with push button start; Power rear door with jam protection; Power windows with auto up/down function on all windows and rear privacy glass; Power adjustable driver and front passenger seats; a 40/20/40 split second-row seat with recline and slide, plus remote release in cargo area; Organic LED multi-information display with Lexus customizable features, ECO indicator, and other driver-focused instrumentation; a voice activated HDD based navigation system with the Lexus Remote Touch haptic controller and an 8” LCD display; Wood and leather-wrapped heated steering wheel and shift knob; 12v accessory power outlets and retained accessory power; Integrated garage door opener; Real wood interior trim; a roof-mounted spoiler; and more. Safety is always standard on a Lexus, and every 2015 RX 450h features Traction Control, Antilock Braking System with Electronic Brake Force Distribution and Brake Assist, the hybrid-exclusive integrated regenerative braking system, 10 airbags, a back-up camera, fast-acting LED brake lamps, Intuitive Parking Assist, Blind Spot Monitor, Active front headrests with whiplash protection, an onboard first aid kit, an anti-theft system, and more. The Technology Package adds: Premium leather seat surfaces; 120v/100w power outlet; Heads-up Display; Roof rail crossbars; front illuminated doorsill trim; LED headlamps; and more. The Executive Package builds on the Technology Package with: a dual-screen rear seat DVD entertainment system with audio and DVD remote control and two sets of wireless headphones. The 2015 Lexus RX 350 SPORTDESIGN and RX 450h SPORTDESIGN are now on sale at Lexus Dealers across Canada. For more information on features and specifications, visit www.lexus.ca/rx.